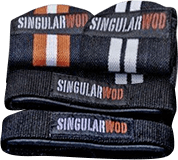 These collars with locks for Olympic bars are an essential item for those athletes who frequently practice weightlifting or functional training. They are made from resistant plastic polymer and have an articulated system that, once the collar is unlocked, facilitates easy removal and replacement of plates. The inner part is covered with rubber to prevent the collar from moving once locked. If you use them with our range of Olympic bars, with striated loading zones, you will feel the safety in each lift. Our Collars with locks and Elite Collar with locks are compatible with any Olympic bar that meets International Weightlifting Federation specifications. The essence of high competition transformed into collars. Reserved for elite weightlifting athletes.